Come on down and create epic adventures in Play-Doh Town! 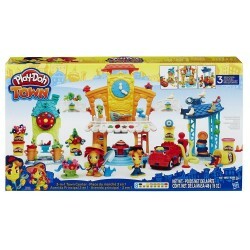 Check out the best spot on the block for Play-Doh Town citizens to stop, shop, and have fun. Create everything from the clock tower, to the figures' hairstyles, to the local birds hanging out on the rooftops! Before the citizens go on a downtown drive, stop at the mechanic shop to make custom hubcaps and other automotive details. Don't forget to squeeze out a silly beard for the mechanic and some Play-Doh gasoline for the car! Next, cruise on over to the restaurant to make Play-Doh dinners, wacky snacks, and make-believe desserts. But this isn't any ordinary restaurant - slide the table back, press the stamp, and pop out a pretend pizza or cake! Stop at the florist to create some beautiful bouquets and delightful decorations to brighten up the downtown area. With so many ways to create and customize the Play-Doh Town Center again and again, there's no telling what kinds of surprising, creative, and hilarious things will happen next! 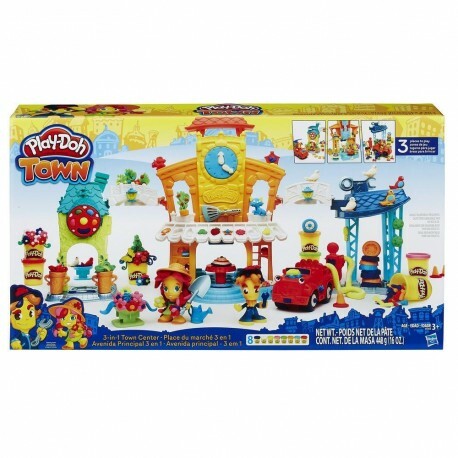 Includes unassembled playset, 2 figures with hats, chef hat, vehicle, 2 stampers, spatula, spade, wrench, instruction, and 8 cans of Play-Doh Brand Modeling Compound.